Crusing around the internet this afternoon I came across a recipe that looked too good to not try. I am currently battling a dislocated rib in my back so I am trying my very hardest to not move around much. So that means long drawn out afternoons of taking pictures is out of the question. Simple is the word of the day. Doesn’t mean it can’t be fabulous though! Right. This is an adaptation from the recipe I found on Poormet – A Poor Man’s Feast. Wash potatos well. Slice length wise into even slices. Now cut the slices into fries. Place the oil and seasonings into a large bowl. Add the potatos and toss to coat well. Using tongs, remove fries from the bowl and place on a foil lined sheet. Leave any extra oil in the bowl and make sure the fries are not crowded. Too much oil on the cookie sheet will result in soggy fries. Bake for 25 minutes then flip and bake for another 20. 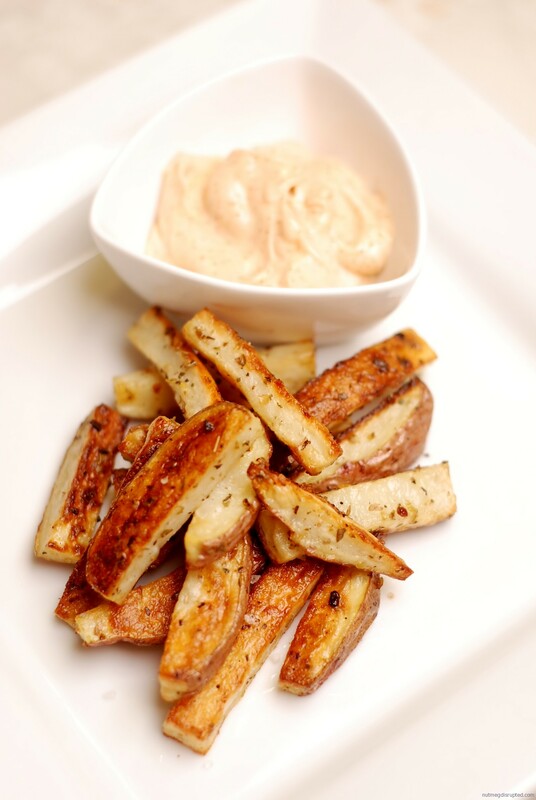 When done, remove fries from oven and finish with a generous pinch of sea salt. You can really play with the flavors of the herbs and spices you add to the oil. Experiment and have fun. You really can not go wrong with any combination. Mix all the ingredients in a small bowl. Allow the flavor to combine before serving. Previous Post - Previous post: Maple Pecan Danish. Next Post - Next post: John Deere feeding the hungry. I wish I had some awesome wipeout story. Unfortunately all I did was a really funky stretch and twist and I popped that sucker right out. Thing is….. I did it about 6 weeks ago and have done just about everything you should NOT do with a dislocated rib. So it is extrememly inflamed and refuses to go back in. I had no idea it was that bad, I figured I had pulled a muscle. The fries were fantastic. Nice and easy. Very good. I am still working on my pictures. I recently got lights as a gift so I am in the process of learning all that. It has bee fun so far. Still trying to lay low until I am all fixed up. Totally easy to whip up at home Vail! If it is just for yourself 3 potatos will be enough. Thanks for stopping by! I found you through TasteSpotting so your doing something right! I am just rolling into my 2nd year blogging and am just starting to get a hang of the pictures. Good lighting is key. But most days it is still a work in progress. The fries were fantastic! And very verstile. i look forward to playing with the flavors further. I’m glad you made these… simple, versatile, excellent. By the way, I envy your photography skills. Looking at your pictures ~almost~ motivates me to figure out what I’m doing wrong in the picture department… too much to learn, not enough time to do it. They definitely made my night better!